Sometimes English words seem vague to native Chinese speakers. Most of you have learned that there is no direct translation for “yes” and “no” in Chinese. Answers to questions are given by using the verbs involved in the question. The word “available” is similar. There is no Chinese equivalent. 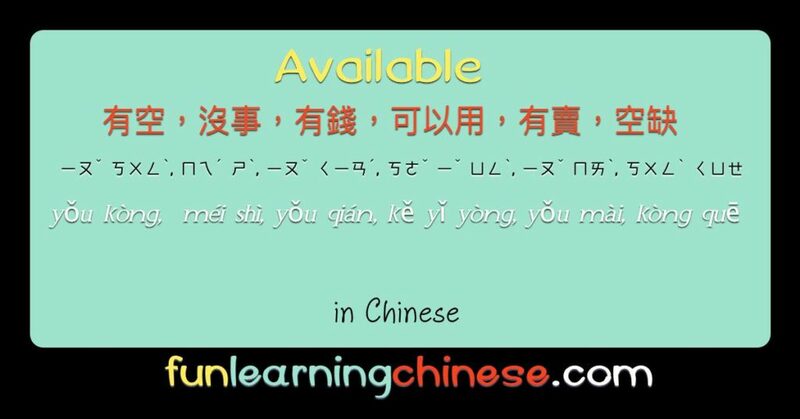 In fact, my Chinese tutor told me it was challenging for her to understand the English word “available,” because it seems rather vague and is used in ways that don’t seem connected from a Chinese viewpoint. Are you available? Do you have time? Do you have something going on? or What’s up? I have something I have to do, I can’t go with you to see a movie! I don’t have time right now, I must help my husband. Right now I have to do something, I have Thanksgiving dinner with my family. Today, I have something going on already, my child is having a birthday party. Oh, I’m so sorry, I have an appointment to get together with a(nother) friend. What if you are wondering if someone has money available to buy or do something? Did you bring some money? If that’s the case, we can buy ice cream. I have some money to buy a bicycle! Do you have a pencil I can use? I have two pens, you may use one. Possibly you are shopping and want to know if a store has a particular product available. Do you sell stamps here? Do you have chicken eggs for sale here? You may need to ask if a size is available. Do you have this hat (available) in a bigger size? Yes, we have this hat in your size! In English, we also ask if a room, space, or job is available. Is there an empty/available changing room? If I may ask, is this parking space available? Does your company have a position available? Is there anyone in the restroom? So while at first it might seem tricky to an English speaker to translate “available,” the trick is to find a verb or description of the specific situation at hand. Do you have time to practice speaking Chinese with me? Get your free lesson pdf here! ❶ You will find 空 used with two different tones in these questions. One 空 is first tone and the other 空 is fourth tone. They have similar meanings, but my tutor says the fourth tone version is used more of time, while the first tone version implies vacancy of 3-dimensional space. A job position doesn’t fit neatly into either category, but has a specific character attached to it to specify meaning. ❷ Without explaining a certain time that you are busy, it sounds like you don’t ever plan on being available. ❹ 有的話 or just 的話 is used frequently to indicate that if a condition is met then something else can follow. ❺ I was reminded that measure word, sometimes also called a classifier, always needs to have a numerical value in front of it, even if it is just one. ❻ However, once a noun has been previously attached to a classifier, it can be implied by just using the classified again with a number. ❼ It is apparently important in Chinese to specify “chicken” eggs. ❽ Although there is currently not much significant difference in clothing and fashion world wide at this point in time, when this word was coined, the western style of a women’s dress was obviously not Chinese. The terminology has stuck, much like French fries are not sometime necessarily associated with French culture.